Yesterday, a poster in our forums claiming to be a Best Buy employee reported that the company's internal inventory system had been updated to show that all MacBook Pro models had been "deleted", preventing Best Buy stores from ordering any new units of the existing models. 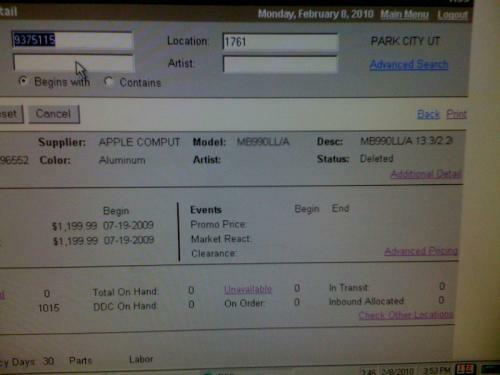 Earlier today, the poster followed up with additional information in the form of screenshots of the inventory system showing the "deleted" status for Apple's current entry-level 13-inch and 15-inch MacBook Pro models. We have heard some whispers that Apple may be planning to introduce new MacBook Pro models tomorrow, coinciding with the Macworld Expo despite the lack of an Apple presence at the event. Late last week, an entry for an unreleased MacBook Pro model based on a new Intel Core i7 processor appeared in Geekbench's online benchmarking database. Best Buy inventory screens are relatively frequent sources of rumors of imminent product updates, and they typically generate a significant amount of interest and discussion. We have been told in the past, however, that the company frequently makes changes to its inventory system in anticipation of future announcements without any official knowledge from Apple. This is not always the case, however, as an unidentified "mobile computing" device that appeared in Best Buy's system last May did turn out to be a revised MacBook that was released two days later. 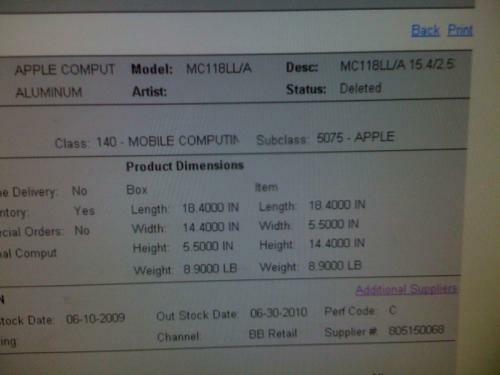 Update: Another Best Buy source has informed MacRumors that the Apple notebooks appeared in the inventory system of the store in question as "deleted" simply because the location does not carry Apple computers in-store. Other Best Buy locations continue to be able to order new stocks of Apple notebooks, although an update to the company's MacBook Pro line is still expected in the relatively near future.